A Stranger Earth: Alien Attack!!! Aliens are all around us here in the United Kingdom. They walk, fly, slither and grow most any place you can imagine. Some are worried, but most don't seem to care. Is David Icke's prediction finally becoming accepted fact? No. For we are talking about plain old, but not quite boring, ecological alien invasion. 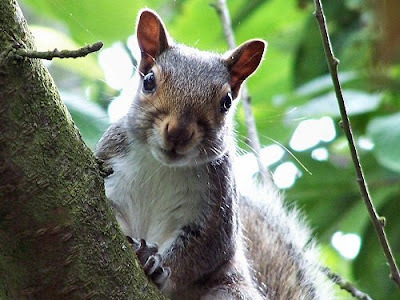 Grey squirrels and Canada geese are so common and recognisable that they feel almost like natives. But there are other, more unusual creatures, which have also come to call our islands home. Wallabies. Yes, wallabies, have managed to survive, if not thrive, here in Britain. In this 2006 article there were supposedly 51 sightings of wallabies over the preceding six years. (There were 5,931 sightings of big cats yet wallabies in Britain aren't controversial but big cats are... go figure!). Once, beyond perhaps an occasional nip by a pike, a Brit could be assured that when stepping into lakes for a dip their digits and dangly bits were in little danger. But no longer as turtles and terrapins have begun to appear all over the place. Reports come from Kent, the Midlands and Cornwall among many other places. My favourite turtle story was of a rather aggressive snapping turtle which had alluded a park keeper for 17 years before finally being caught. Snapping turtles are no joke when they give you a quick "nip". But could even more dangerous reptilians be stalking the unwary from our ponds, lakes and rivers? 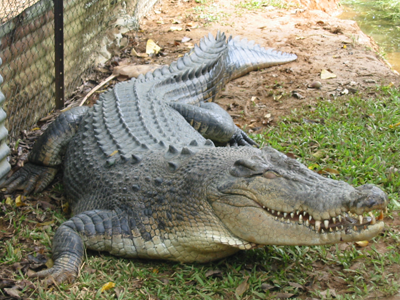 Some claim to have seen crocodiles in such places as Swansea, Staffordshire and an alligator in the Midlands. Perhaps we might need to keep an eye on more than just our toes when taking to the water. Most of the animals typically reported are obviously headline grabbing but some are slightly more worrying, well for arachnophobics anyway! Check this story for examples of alien spiders in Britain and for another growing trend: the prediction of future alien invasions. These days no story about an alien invasion can be complete without the end warning of the imminent approach of *insert ever more scary species here*. 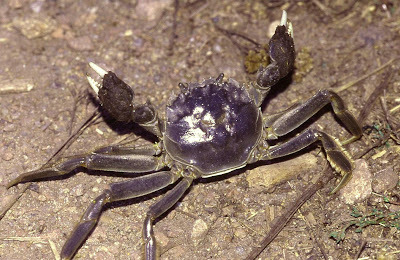 In our rivers foreign crabs and crayfish threaten our flora, fauna and even our river banks! As you can imagine this sends our press into a frenzy of ecological xenophobia. They are so used to this that when an extinct native species is returned, such as the beaver, they are torn between terror and jubilation. It's interesting to watch. Personally I think it's time we reevaluated the way we deal with invasive species. Many species we consider perfectly acceptable in this country such as hares, rabbits and pheasants are in fact simply successful invaders. Invasion of new territory by more well adapted species is called progress. Yes things will change. Yes species will die. But perhaps we should spend more time worrying about keeping our planet healthy and less about keeping it "genetically pure". Don't get me wrong, I think efforts to protect the red squirrel, our native crayfish and other species and habitats threatened by invaders are extremely well intentioned and very worthy. But perhaps we should try merely to keep them alive for their beauty and the joy they bring and not just because they are native and other animals aren't. Let's not let humanity's racist thoughts blind our policy towards the environment. A healthy environment free of plastic, toxins and other trash might enable native species to expand back to ranges lost which might ensure a longer term future for them whilst allowing space for change and evolution from the more exotic members of Britains ever changing family of flora and fauna.